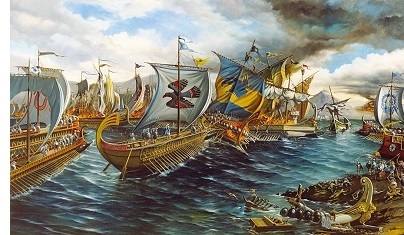 Battle of Salamis (480 B.C.) - After Thermopylae, the Persians moved on to Athens and burned the temple (the original Parthenon). But the Athenian citizens retreated to the island of Salamis and relied on their navy to protect them. Xerxes was furious over the losses he had suffered at Thermopylae and wanted immediate victory. Instead of starving them into submission, which he likely could have done, he attacked the Greek navy with his own. The smaller, more maneuverable Greek triremes proved superior in the tight quarters of the Saronic Gulf and Greece was victorious.